Crowds gathered Saturday for St. Patrick's Day celebrations downtown. CHICAGO (WLS) -- Large crowds gathered for Saturday's St. Patrick's Day festivities downtown. Although St. Patrick's Day is actually on a Thursday this year, Chicago will be marking the day all weekend long. Some started the day at Mass at Old St. Patrick's Church in the city's West Loop neighborhood. 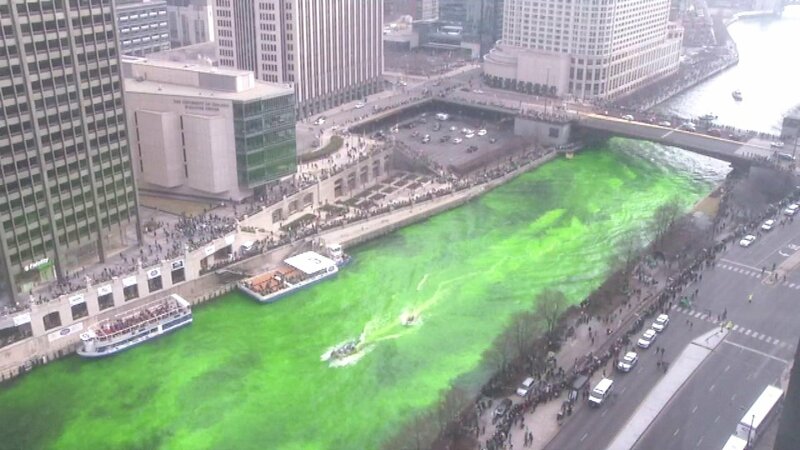 Spectators gathered along the riverfront in the Loop for the annual dyeing of the Chicago River, which began at 9 a.m.
Watch the 2016 dyeing of the Chicago River for St. Patrick's Day. "We're going to make that river bright green today! We have a fountain on the back of the boat and we're going to lead this down the river and it's a secret formula that we dye the river with - non-toxic secret formula," said Jim Majerowicz, Plumbers Union, river dye crew. The 33rd annual St. Patrick's Day parade downtown began at noon at Columbus and Balbo and featured many floats, bagpipes and marching bands. This year's parade Grand Marshal was Illinois House Speaker Mike Madigan. The celebrations will continue Sunday with parades on the city's South Side and Northwest Side. Watch an on-demand version of ABC7's broadcast of the parade here. Join ABC 7 Live for the St. Patrick's Day Parade, Saturday, March 12th at Noon.